Grand View Research, Inc. – Market Research And Consulting. The global decorative coatings market is expected to reach USD 106.97 billion by 2022, according to report by Grand View Research, Inc. Rising construction spending in light of urbanization, population growth and government infrastructural plan will augment industry growth. According to a report published by Grand View Research, Inc.; the decorative coating market is expected to reach a valuation of around $106.97 billion by 2022. Rapid urbanization and infrastructure development and rise in expenditure for construction can drive the market during the forecast period (2012 to 2022). In addition, rise in expenditure coupled with ongoing product development for improving the performance of these product will drive the market in the coming years. Increasing demand for these coatings in buildings as it provides durability and better appearances of the surface and protects it from exterior conditions such as extreme temperature, UV radiation, foreign particles and acid rain can support the market growth. Additionally, associated properties of these coatings such as corrosion resistance, bacteria and moisture resistance are likely to bolster the market growth over the forecast period. Technological advancements such as green coatings, Nano-TiO2 photo catalysts, and development of methods for reducing drying time is likely to boost the market during the forecast period. Additionally, development of nanocoating coupled with green coatings is projected to create new avenues in the market. However, volatile nature of raw material prices and associated hostile environment impact of solvent borne coatings is major challenge for the market. Worldwide decorative market can be segmented on the basis of product, technology, application, and region. Based on product, the market can be categorized into primer, enamel, emulsions, and others. In 2014, the emulsions segment was the leading segment and estimated for over 35% of the total market volume. The segment is expected to grow on account of its low VAC and VOC content. The primer segment is likely to grow with an estimated CAGR of 6.3% during 2015 to 2022 as it acts as a leveler and protector, thus makes coating smooth. As per technology, the market can be classified into waterborne coatings and solvent-borne coatings. 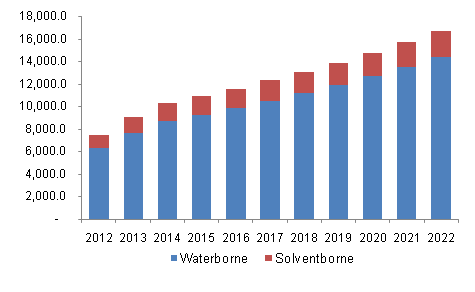 In terms of volume, the waterborne coatings segment is anticipated to show rapid growth at a CAGR of 6.5% during 2015 to 2022 due to its exceptional abrasion, heat resistance, and adhesion properties. In addition, its benefits over solvent-borne such as less flammability, less toxicity, and less air emissions can drive the segment growth over the forecast period. The U.S. EPA and REACH promotes use of waterborne technology, which is likely to support the segment growth in the coming years. On the basis of application, the market can be spilt into residential and commercial. Geographically, the market can be divided into North America, Europe, Asia Pacific, Latin America, and Middle East & Africa. In 2014, Asia Pacific dominated the overall market and was valued at USD 20.23 billion market in terms of volume and value. The region is expected to continue same trend over the forecast period on account of rise in spending for construction and rapid economic growth in India, China, South Korea, Indonesia, and Thailand. China is likely to increase the product demand due to increasing domestic procedure coupled with growth in infrastructure sector. Middle East and Africa is anticipated to exhibit significant growth with CAGR exceeding 6% during 2015 to 2022 due to rise in infrastructure development, presence of advanced real estate regulatory framework, and growing construction activities especially in UAE and Qatar due to economic recovery. In 2015, North America estimated for over 15% of the overall market share. This region is likely to show substantial growth on account of infrastructure development and re-development in the U.S. and Mexico. Increasing government efforts on reducing carbon footprints by deploying environment friendly products will boost the waterborne coatings industry during the forecast period. Some of the leading companies operating in the market include Axalta Coating Systems, KCC Corporation, Sherwin-Williams, Axalta Coating Systems, and Masco Corporation. The market is extremely competitive and major market participants are involved in R&D activities and continuous product innovation. Increasing efforts from manufactures for developing high performance, and cost-effective products is also likely to drive the product demand in the years to come. Explore the BI enabled intuitive market research database, Navigate with Grand View Compass, by Grand View Research, Inc.
Company Name: Grand View Research, Inc. Contact Person: Sherry James, Corporate Sales Specialist – U.S.A.